The earliest member of the Robbins family found so far is Margaret. We have no certain record of her birth or her parentage. 10 Feb 1604/5, Bradford, Margarett d. of Humfry Robins. Tawstock is the nearest to Littleham, where she settled, at 8 miles, Shebbear is 9 miles, Bradford 10 miles, Hatherleigh the furthest at 13 miles. The early registers for the little parish of Landcross, adjacent to Littleham, are faded and hard to read but do not appear to contain the name Robins. There is a gap between 1608 and 1617. Given that Margaret herself had a baseborn child, the Tawstock baptism seems most likely, but this is by no means conclusive evidence. In 1626 Margaret brought her fatherless baby to the church of St Swithuns in Littleham by Bideford to be baptised. 1625/6 25 Jan Charles son of Margaret Robings. Littleham is a well-wooded parish south of Bideford. The River Torridge forms its eastern boundary and the River Yeo its southern. 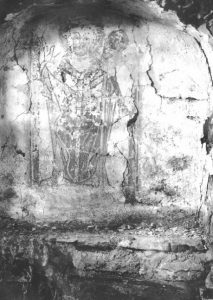 When the church of St Swithin was being restored in the 19th century, a number of wall paintings were discovered. They had been plastered over and replaced by texts. This may have happened at the Reformation in the 16th century or under the 17th century Puritan Commonwealth following the Civil War. If the latter, then Margaret would have seen them every Sunday when she came to church. On the eastern wall of the north transept was a painting of St Swithin, a 9th century Bishop of Winchester. “The Bishop is shown wearing a dark red chasuble – a long sleeveless outer vestment worn when celebrating Mass – together with red gloves. He holds a pastoral staff in his left hand while his right hand is raised in the attitude of blessing with the two fingers and thumb extended.” This can be still seen today. Seven years after Charles’s baptism, Margaret married John Hill. Less than a month later a daughter was baptised. 1632/3 22 Feb Marie d. of John Hill. Whether John was Marie’s father is uncertain. If he was, and he was willing to marry Margaret, it is surprising that he did not do so earlier. The Overseers of the Poor would sometimes pay a man to take a woman off their hands who would otherwise be an unmarried mother in need of parish support. Another daughter was born two years later. There is a burial in Littleham on 1 March 1644/5 for ‘John Hill Clarke of Littleham’. This could mean that Clarke was his surname, but it seems more likely that he was John Hill, and that he was the parish clerk. If so, then he was in charge of the orderly running of the services, and would have helped to lead the singing. His death would have been at the height of the Civil War in Devon. If Margaret was widowed then, she would have had the support of her son. He married three years later. Unfortunately, one of her two granddaughters died the year before Margaret. After Margaret’s death, the villagers contributed to a collection for “the Redemption of ye Xtian Slaves in Turkey’. Charles was among those contributing the lowest amount, 6d, showing he had a low income. Paul Hill contributed 1s and his wife 6d. Whether they took any share in supporting the widowed Margaret we can only guess. Margaret died in 1665, five years after the Restoration. She was probably in her sixties. Herbert George Morse. The Church of S. Swithin, Littleham. London: Pickering & Chatto (1900).